12.5" RCOS @ ~f/9 (2880 mm fl) at 0.64 arcsec/pixel. Shown at 1.78 and 1.28 arcsec/pixel. 12/24/2011 to 1/14/2012 Chino Valley, AZ... with CCD Commander & CCDSoft, AOL guided. eXcalibrator v4.30 for (g:r) color balancing, using 49 stars from the SDSS-DR9 database. NGC 660 is a polar ring galaxy in the constellation Pisces and is about 25 million light years from Earth. These types of galaxies typically have an outer ring of gas and stars that rotates over the poles. Polar rings are thought to form when two galaxies interact with each other. The ring may have been formed from material that was stripped away from a passing galaxy. 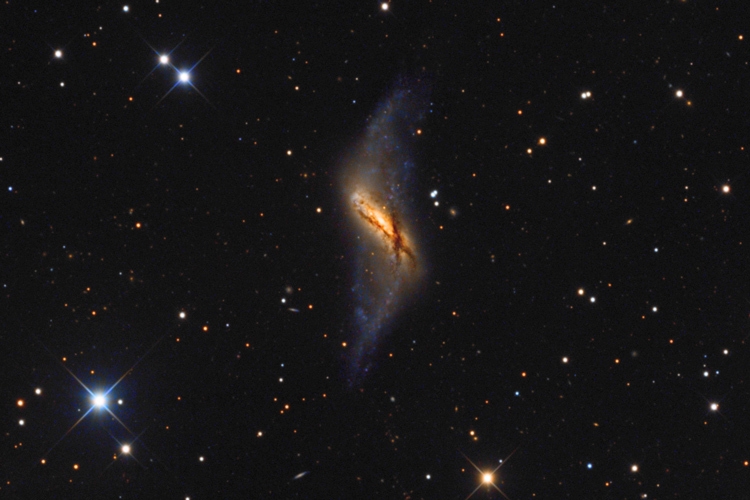 Another possibility is that a smaller galaxy collided with NGC 660 and formed the ring.